There is a serial killer in London. He has beaten four women to death and then burnt their bodies in secluded areas of parks. No link can be found between the women. Maeve Kerrigan is an ambitious detective constable who is the only woman on the hand picked team of Superintendent Godley - the man in charge of the investigation into the killer that the press has dubbed "the Burning Man". There is little evidence to go on until a young woman fights back and seriously wounds her abductor. Maeve is asked to interview her and has doubts that the young woman is really the victim of the man who is terrorising London. 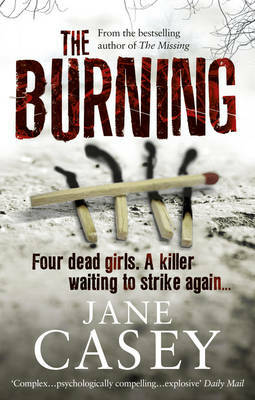 A fifth burnt body is found - but as Maeve interviews the victim Rebecca's friends and family she again starts to have doubts that “the Burning Man” was responsible. As Maeve becomes very close to Rebecca's closest friend, Louise, she starts to fear for Louise's safety when Louise becomes involved with Rebecca's ex-boyfriend, who has a history of violence to women. I enjoyed this book. There is enough to keep the reader guessing with red herrings and sub-plots that bring the characters to life. This is the writer's second book - I am already looking forward to reading her first - THE MISSING and will look out with anticipation for the third, THE RECKONING.